Grace Lin’s fairy tale novel reflects the value of contentment. Anyone who has paid attention to Newbery Medal– or Honor–winning children’s books will know that most of them deal with a preteen, the preteen’s friends and family, most likely poverty and/or disease and most definitely an animal. Most of them also deal with the death or loss of one of those things, the main character, friend, family, or animal. Not this one. Where the Mountain Meets the Moon by Grace Lin is a fantasy feast of wonder and joy, filled with sumptuous full color and monochromatic pictures like old-fashioned fairy tale books. Minli lives with her Ma and Ba in the poverty ridden Village of Fruitless Mountain. The family works hard all day, and Minli’s only outlet for her imagination is the fairy tales her father tells. One fateful day a man selling goldfish walks into town and Minli, the only person with any money buys a goldfish, and hears the tale of the goldfish man, who tells her that the Man in the Moon will grant her wish for a better life for herself and her Ma and Ba. So Minli sets out that night heading for the place where the mountain meets the moon. 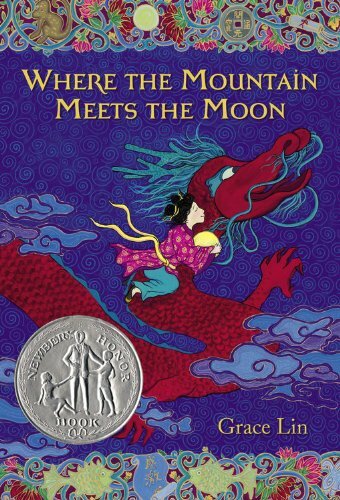 On her travels she meets characters from popular Chinese folk tales, and with the help of a dragon called Dragon, brings wealth and prosperity to Fruitless Mountain. Where the Mountain Meets the Moon is sort of like The Wizard of Oz in its aim and scope. Minli’s quest to reach the Man in the Moon teaches her a valuable lesson: that of contentment, by showing her that as long as she has her friends and family, she’s as rich as a queen. Though Minli is never greedy and always giving, this is a valuable lesson for her and her family. The story does have a hefty dose of magic of the usual fairy tale type, but those looking to use magic for their own ends of greed will be punished. Minli does lie to her parents when she sets out for the Mountain, but this is never presented as a great idea, and this is commendable. Fans of the fairy tale genre will want to read this book. Parents will want to read this book. Kids will love Minli and Dragon’s trek to the impossible, while learning the important and wholly Biblical lessons of contentment and unselfish giving while having fun. Grace Lin has recaptured the wonder of the old tales as written by Anderson and Le Prince de Beaumont — a wonder sorely needed in today’s children’s literature. This was such a beautiful book.